We made this as a Sunday night dinner for two and it is rich and packed full of flavour. Pheasant is appropriately in season in Ireland at the moment, as are apples, so a perfect choice. Heat a casserole, just large enough to fit the pheasant. Season the cavity and spread the 10g of butter over the breast and leg. Place breast-side down in the casserole and allow to brown over a gentle heat, then turn over and season. Cover with a tight lid and cook for 40-45 minutes in the oven. To check if it is cooked, poke a fork between the leg and the breast, the juices should be completely clear with no pink.Transfer to a serving dish and keep warm. Carefully strain and de-grease the casserole juices. Bring to the boil, add the Calvados and carefully light with a match. Shake the pan and when the flames have gone out, add the cream (or stock and cream). Reduce by boiling until the sauce thickens, stirring now and then, taste for seasoning. Peel, core and dice the apples and fry in the 25g of butter until golden. 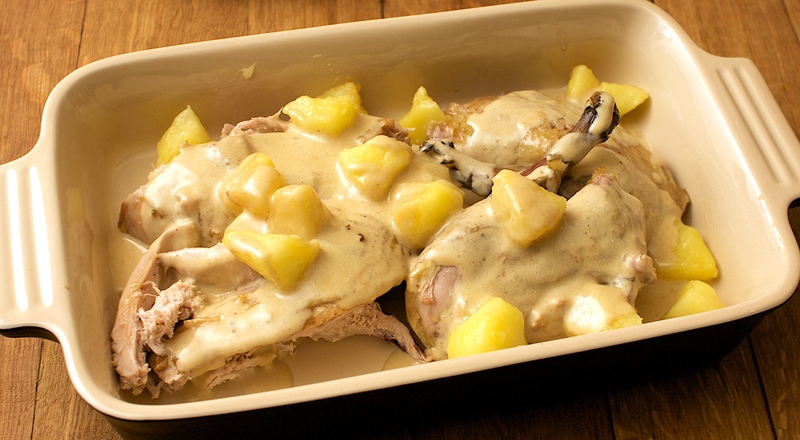 Carve the pheasant and arrange on a hot serving dish or on individual plates. Cover with the sauce and serve with the apple. We also had some colcannon on the side. Wine Suggestion: You need a powerful and earthy red, balanced with good acidity for this dish. We drank a 2005 Cornu Corton-Bressandes Grand Cru 2005 on the inspiration of one of Jono’s customers who was looking for an opinion; we heartily endorse it as it had the depth and personality to stand up to the rich and powerful flavours with it’s own power, depth and freshness. Superb. Burgundy and game work really well.